.....and Recommended To Educators For Use as a Superb Interactive Educational Curriculum for Kids Between the Ages of 9 and 14. Can You Beat The Street? BEAT THE STREET! is all about making Good Choices, Better Decisions, and Accepting Responsibility. BEAT THE STREET! helps children to learn that the Decisions They Make ... Create the Consequences They Experience! BEAT THE STREET! includes a CD-ROM, Parent-Educator Guidebook and a BTS! Theme Song on Audiocassette. Students will love this learning-through-fun educational software that provides them with preventative skills and proactive solutions for living in the real world today. Presenting real-life situations that take place before, during and after school, this highly interactive CD-ROM game challenges students to make decisions that avoid and prevent negative behavior. In a fun filled challenging and interactive setting, BEAT THE STREET is loaded with lessi\ons about avoiding bullies and angry peoplem and how not to become a victim. Through making their own decisions, students learn that aggressive behavior can be avoided and how to get along rather with one another rather than fight, and theyalso learn to take responsibility when they have made a mistake. Young users, during the interactive game play, see how their choices can prevent conflict, and learn how to use Conflict Resolution as a positive solution to conflict that cannot be avoided. 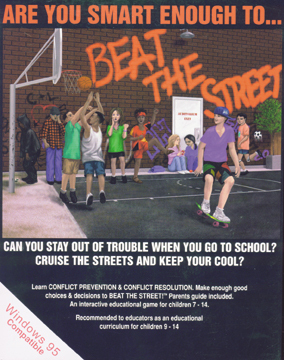 The BEAT THE STREET CD-ROM Includes more than 100 scenarios, featuring cool graphics and positive, game-oriented rap music, plus a street-wise Guide named Chewy. Chewy is the cool alter-ego friend and mentor in the game (a kid who has been in street-trouble, but has learned his lessons and knows how to Beat The Street!). Chewy pops up from time to time to talk to the player about his or her decisions. He may warn, admonish, congratulate or remind about the possible results of a choice that was made. He talks in rhymes just for fun, and because he knows that lessons presented in an upbeat, positive way are easier to learn and remember. The object of the game is to BEAT THE STREET! by making decisions and choices that will get you through the day and home safely. Make one wrong kind of decisions, and the players could wind up in a fight, a trip to the Office of the Principal, or even a gang house where a kid accidentally gets shot, resulting in the player getting picked up by the police and even being sent to Juvenile Detention by a judge. At this point, you get Beat BY the Street! 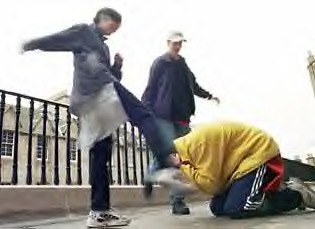 The more aggressive the player becomes with his or her choices, the more aggresive the STREET responds! To BEAT THE STREET! players must make Street Smart decisions, not necessarily the ones that are always the most fun or exciting. Every player starts with a score of Zero. Good choices have positive values based on the importance of the decison, and bad choices have a negative value. Scores are logged, tallied and shown on various scorecards as the BTS day progresses and are printable. Best of all, when playing BEAT THE STREET, a stream of educational messages are available when the option is presented. These lessons have important information that each player will need in order to pass the Conflict Resolution Test at the end of the BTS school day. As an unique educational game on Conflict Prevention and Conflict Resolution and so much more, each player must pass the Life Studies test at the end of BTS school to BEAT THE STREET! BEAT THE STREET! is Much, Much More than Just a Game! This is what BEAT THE BULLY PROBLEM is all about. Created for parents and educators to help children, and for children to learn how to help themselves, this self-help booklet addresses this national and international problem in very real terms. It has clear and concise pages loaded with preventative measures and protective solutions to eliminate the cold, cruel behavior that intimidates, injures and even critically harms children. BEAT THE BULLY PROBLEM is all about NOT becoming a victim! --What, for example, should a child do if he or she is the victim of bully or gang threats? --As a parent, what can and should you do? --What are the hidden signs of a bullying victim? --How can the clothes kids love incite violent attacks? --Where is it safe to hang out and where is it not safe? --Is fighting back a solution? --What do words like Swarming, Taxing and Whirlpooling mean? --What about Graffiti? Is it just an art form? --Is what we know about violent, victimizing behavior truth or myth? --How can everyone Parents, Police, Edicators and Schools and the Community work together as an integrated task force to beat the bully and gang problems? --talk and feel strong in any situation. It teaches how to prevent and avoid dangerous situations; and what to do if you get into one; and how to help. Addressing tough, difficult-to-talk-about issues are the trademarks of both BEAT THE BULLY PROBLEM and BEAT THE STREET CD-ROM, featured above, as well as all other conflict and violence intervention and prevention resources featured on this website. The bully and gang problems are tough and dangerous issues that adversely affect our entire social order and the peaceful environments of our schools, our families and our homes. It puts the future of our young people at risk and must not be allowed to continue. You Can Beat The Bully Problem! Parents used to worry about smoking in schools! Today, smoking takes on a whole new meaning. Schools are plagued by them. Parents can beat the problem head on with help from BEAT THE BULLY PROBLEM. BEAT THE BULLY PROBLEM offers parents and educators prevention tactics and solutions, along with insight to bully behavior. Please Feel Free to Contact Us For Purchasing Details.